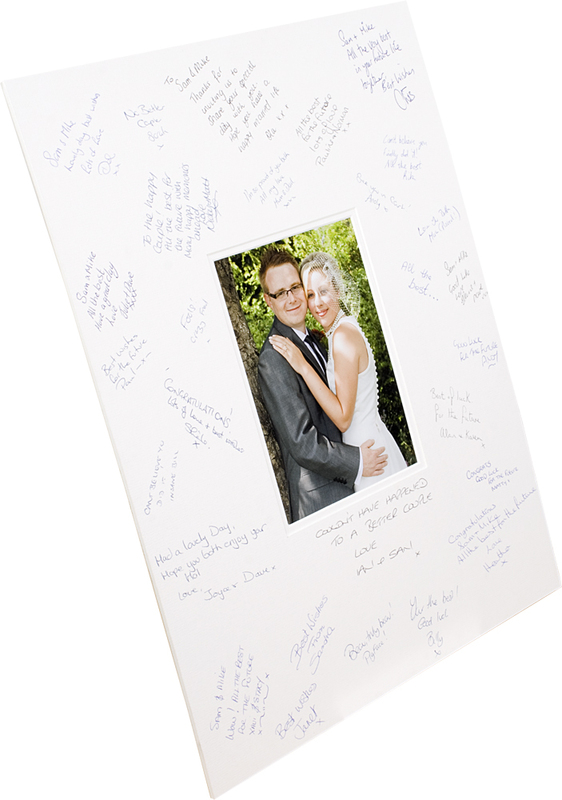 Our wedding signature boards are a great way for family and friends to record their well wishes for the happy couple. We mount a professional photographic print onto a quality backboard ready for guests to pen their heartfelt sentiments alongside a picture of the beaming newlyweds. With three different sizes to choose from, there is sure to be space for everyone to scribble down a few words for you to look back on once the day is over. The signature board is a beautiful keepsake that is a fun alternative to the more traditional and formal guestbook. It’s both a personalised and decorative piece that will truly be cherished forever. Allow guests to write their messages in different colours to liven up the board, or keep it classy with gold or silver ink only. We recommend framing your signature board for extra protection and to create a great display piece for the home. You might forget what people say to you on your big day, but with a signature board as a guest book you will have a lasting visual reminder of how happy all of your nearest and dearest were to share your big day with you.